2019 Young Performer’s Award Announcement! Magisterra Soloists is proud to announce the 2nd edition of its searchlight audition for young string players: the Young Performer's Award! We are excited to open up this year's audition to not only violinists, but also violists and cellists! This year's award recipient(s) will have the chance to perform solo with Magisterra Soloists at its 2019 Gala and receive a special monetary honorarium! See the attached form for details and application deadlines! First Magisterra “Young Performer’s Award" Recipients announced! Congratulations to Tina Huang and Raina Welburn who both were selected as the 2018 Magisterra Soloists Young Performer’s Award Recipients! at the Design House London. 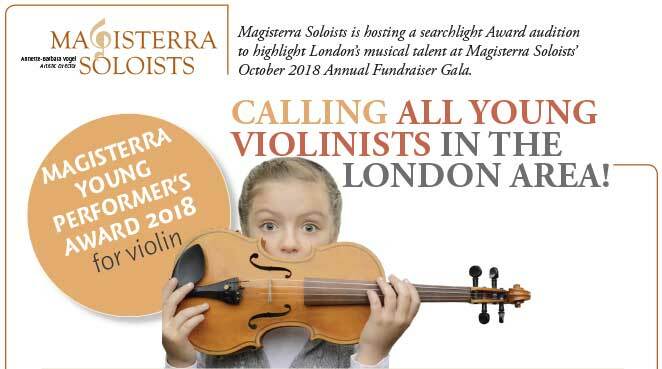 Magisterra Soloists is launching its first “Magisterra Young Performer’s Award”.